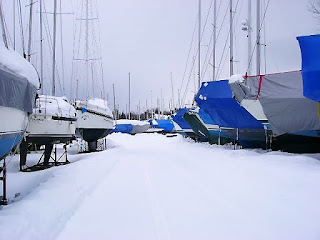 Trafalgar Wharf: Winter Storage. Have you got yours arranged yet? Make sure you have your boat stored safely this year ready for winter. Here at Trafalgar Wharf Portsmouth we have a variety of safe and sheltered moorings. Our marina is suitable for boats up to 9 meters in length. 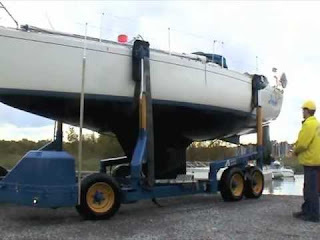 Our storage ashore is available for boats up to 18 meters. Our fully trained and insured boat yard team can lift and launch most types of boats up to 24 tonnes with our Sublift. We are ideally situated at the top end of Portsmouth Harbour (only minutes away from the M27) where we're protected from the gales and rough seas to give you peace of mind whilst your boat is stored with us. We have plenty of free parking on-site as well and water and power hook ups. Look after your boat over the winter so she can look after you when you're out enjoying yourself on the water the rest of the year. Call Corinne now on 02392 387833 before the winter arrives and she'll give you a quote to get your pride and joy safely tucked up for the winter. Book by the 19th October with a refundable £50.00 deposit and receive a 5% discount. We will also give you another 5% discount if you pay upfront in full upon arrival.